Dr. Henriod can treat gum disease without surgery using the LANAP procedure. 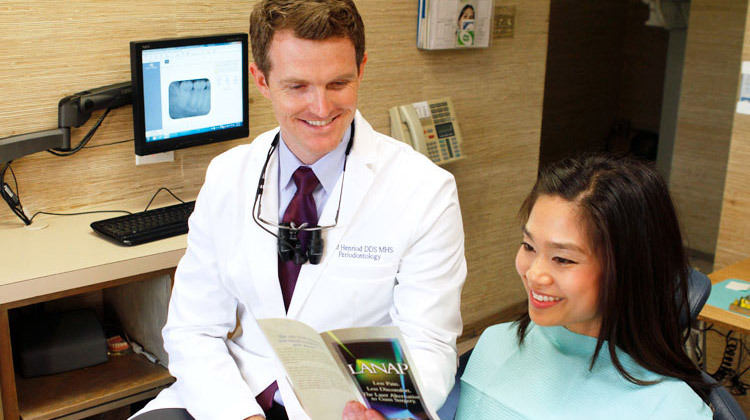 Laser-Assisted New Attachment Procedure (LANAP®) is an FDA-approved procedure used to treat moderate to severe gum disease through the regeneration of tissue, rather than the removal of tissue. Instead of removing a section of gum tissue with a scalpel, as in traditional periodontal surgery, a precisely focused laser is used to remove only diseased gum tissue without affecting the healthy tissue. Dr. Henriod demonstrates how the tiny fiber is inserted between teeth to eliminate gum disease. Using a laser, rather than a scalpel, also stimulates the body’s natural regenerative potential, usually eliminating the need for gum grafting around the teeth. Dr. Joel Henriod is highly trained and experienced in using LANAP to effectively combat gum disease. As a periodontist, he has many years of specialized training in diagnosing and treating conditions related to the gums. The LANAP procedure requires fewer visits. Traditional surgery requires four sessions of about an hour apiece, plus several visits for suture removal and additional check-ups. With LANAP, only two visits of about two hours and two follow-up visits are needed. Rather than weeks, there’s less than a 24 hour-recovery period with LANAP, and most people are able to eat and drink anything they want immediately following the procedure. Due to the minimally invasive nature of the procedure, there is maximum preservation of the original gum tissue. LANAP is safe for patients with health concerns such as diabetes, HIV, hemophilia, or those taking medications, including Plavix or aspirin. LANAP provides long-lasting results. A study showed that after five years, 98% of patients treated with LANAP remained stable. Digital X-rays taken with our 3D cone beam scanner provides detailed information for Dr. Henriod, which he uses to plan your treatment on advanced computer software. Dr. Henriod will perform a oral exam to see if you’re a candidate for LANAP. You’ll get an opportunity to discuss concerns, have treatment options explained and get any questions answered. If needed, we will take digital X-rays of your mouth to make a more precise diagnosis and to discover the extent of the gum disease. For a closer look, or if we suspect other issues in the mouth or jaw, we will take 3D X-rays using our cone beam CT scanner. When you return for your first LANAP treatment, you’ll get a local anesthetic to eliminate any discomfort. The LANAP procedure is much less traumatic then conventional surgery, but if desired, sedation can be used to help you be more relaxed. The LANAP procedure uses a tiny, soft-tissue fiber that is about the thickness of three human hairs. We use a soft-tissue laser with a fiber about the thickness of three human hairs. This is inserted between your teeth and gums to eliminate bacteria and diseased gum tissue. Healthy gum tissue is not harmed in the process. Once this is done, we use an ultrasonic scaler and special hand instruments to remove tartar from the root surfaces. Lastly, the laser is used to finish cleaning the gum pocket and to assist in sealing the pocket so new germs cannot enter. The gum heals, re-attaching to the clean surface of the tooth root.